After you have made a bootable USB flash drive or a CD or DVD using the steps described in Preparing_for_Installation.adoc#sect-preparing-boot-media, you are ready to boot the installation. Note that the steps described below are generic and the exact steps will vary somewhat depending on your system - particularly on your motherboard manufacturer. 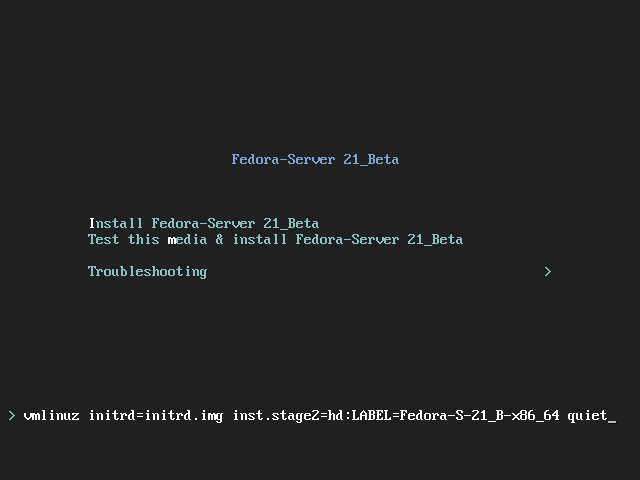 Also note that Fedora only fully supports version 2.2 of the UEFI specification. Hardware that supports version 2.3 or later will boot and work normally, but the additional functionality defined by these later specifications will not be available. The UEFI specifications are available from http://www.uefi.org/specs/agreement/. All available Anaconda boot options are described in ../advanced/Boot_Options.adoc#sect-boot-options-available.